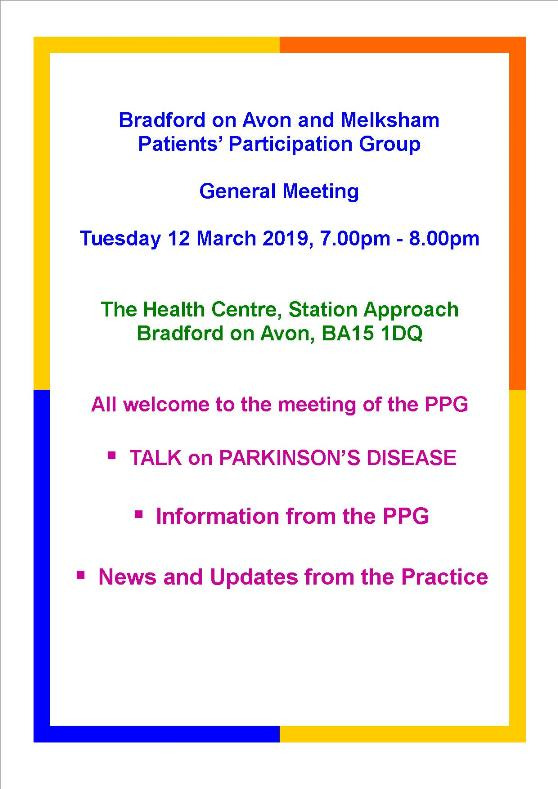 The PPG is a group of patients and practice staff who meet at regular intervals to decide ways of making a positive contribution to the services and facilities offered by The Bradford on Avon & Melksham Health Partnership . We would be grateful if you would complete this survey about the Patient Participation Group. 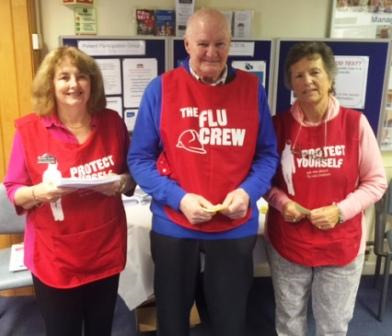 Thank you to our Patient Participation Group for their kind help! Improving facilities at the Practice. Developing and implementing social activities for patients such as trips for the elderly, walking for health groups, babysitting circles and voluntary/honorary grand parenting. The running of the Group really depends upon the group of people involved. Full meetings are held quarterly with the executive meeting on a monthly basis or as necessary between these main meetings. Meetings are mainly held at The Health Centre, Bradford on Avon. Please scroll down to see future meeting dates. From left to right - Jen Andrews (Treasurer), Sue Walters (Chairman),Denise Ramsay (Secretary - not pictured). The Officers join a further 3 members of the PPG (not pictured) which makes up the full PPG Committee. The PPG welcomes new members, particularly representatives from the under 18 age group, parents with young children and patients with sensory or physical impairments. Please ask at the Health Centre reception for details of who to contact of the PPG executive committee or just come along to one of the quarterly meetings. You can obtain a registration form by clicking here. If you are unable to attend PPG meetings but would still like to help the practice improve services, you may be interested in signing up for our virtual e-mail group. For more information please click on the tab above titled 'Patient Voice e-mail group'. As a Practice we are always looking at ways to improve the services we provide patients, one of the ways we do this is by reflecting and acting upon patient feedback. By filling out a feedback form in the surgery and placing it in the Suggestion Box. By completing our feedback form online. By speaking directly to Sarah Smith at the Surgery - 01225 898491. Further ways of providing feedback are explained in the 'Have your say!' flyer. Please click here to open this document. Since 1st December 2014 the 'Friends and Family Test Survey' has been incorporated into the suggestion box. The Survey is short and asks how you feel about the services at the surgery and how likely you are to recommend them to friends/family. The survey is located here - We look forward to hearing from you! 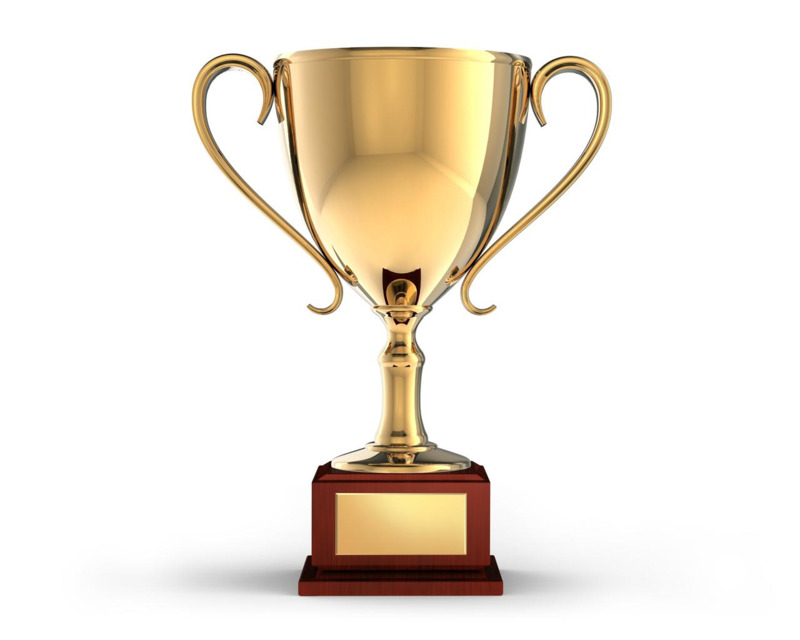 The PPG are thrilled to announce that the Friends and Family Test team at the surgery (which is comprised of practice staff and members of the PPG) have won a NHS England National Award for the Friends and Family Test Survey Process. The PPG are keen for children and young people to have the opportunity to give their views and experiences about their visit to the surgery. In December 2015 to Februar 2016 the surgery too part in a pilot scheme and the PPG supported this work. 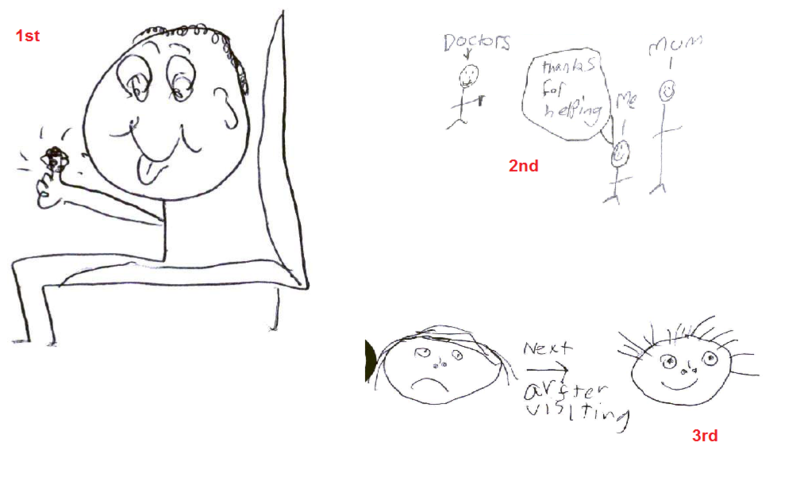 During the pilot, children and young people were asked to fill in a feedback form. On the form was a space for a drawing of their visit. Please click here to view the form & please click here to view the results of the survey. Since December 2013 the PPG, at their quarterly meetings, have been working their way through the 21 Way to Thrive document (which can be found on the National Association of Patient Participation website). The document gives Patient Groups ideas of what they can do to improve services at the Surgery, engage with other patients and how best to work with the Practice. The PPG will now start to work through the list in order of priority. Do you have any suggestions of what other talks could be given at future PPG meetings by a speaker? What medical subjects interest you? The PPG are affiliated with the National Association of Patient Participation. Established in 1978, NAPP is uniquely placed as the only UK umbrella organisation for patient-led groups in general practice. They provide essential support to PPGs through a comprehensive range of evidence-based high quality specialist resources developed from other thirty years experience and formation of hundreds of Patient Participation Groups. This campaign demands that governments increase funding for general practice from historic low 8.39% to 11% UK NHS budget by 2017. For those patients who are unable to attend a Patient Participation Group Meeting have set up a virtual patient representation e-mail group so that you can have your say. We ask the members of this group some questions from time to time, such as what you think about our opening times or the quality of the care or service you received. 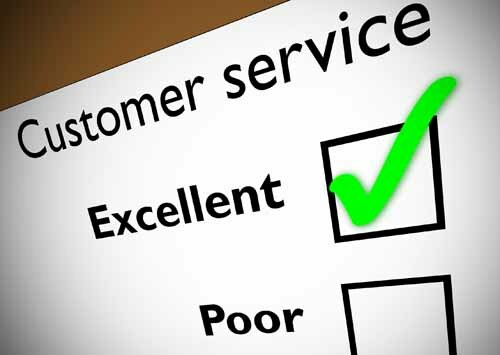 We will contact you via email and keep our surveys succinct so it shouldn’t take too much of your time. Your contribution will be very much valued and appreciated. Did you know you are able to provide feedback to the Surgery via a number of different ways?.....click here to find out! The surgery would like to thank the Bradford on Avon & District Flower Club for kindly creating and donating flowers on a regular basis for the waiting room at The Health Centre, BOA. Patients and staff regularly comment how beautiful they are and the Partners are grateful for the Flower Club for taking the time to do this for the surgery. Do you like flowers, decorating your home, entertaining friends? If the answer is yes, you might like to join the Flower Club who meet on the first Thursday of March, April, May (AGM), June, July, Sept & October in Holt Village Hall (BA14 6RW). 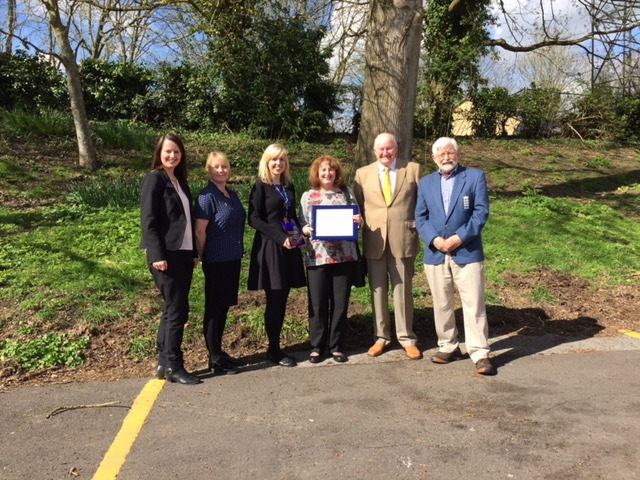 Chelsea Flower Show – Special congratulations to two members of the Flower Club, Lucy Ellis and Cath Humphries, who were on the South West Area of NAFAS’s team and won a gold medal! "The Voice of Older People"
Are you over 60? Are you a carer? Do you have a big enough say in the decisions that affect your life? "Age Matters - The issues which face older people & carers in Winsley"
Your chance to meet Wiltshire Council's Community Engagement Manager for our Area Board and tell them what really matters to you - about local health services, transport, traffic, social activities, disabled access, pedestrian safety -everything which really matters to you. 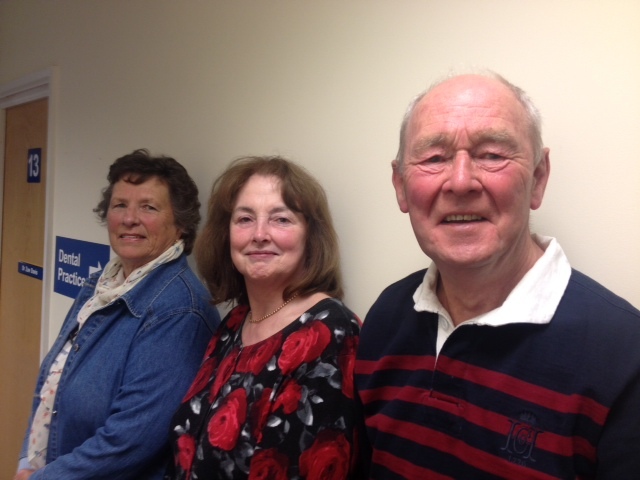 At the most recent meeting, the Senior Citizens Forum shared that they are planning a group trip in the Spring 2014 to the Independent Living Centre in Semington. The PPG fully support this trip as the Independent Living Centre offer free impartial advice to the elderly and disabled with practical solutions to difficulties in daily living to people living in Wiltshire, Bath and Mendip areas. At the Centre, you can see and try a wide range of products. To find out more information on the trip, please click here. Alternatively, to read more about the Independent Living Centre, please click here. Been to the RUH recently? Had help from Social Services? The Senior Citizens are asking for feedback (good or bad) if you, or someone close to you, has been to the RUH recently, as an in-patient or an out-patient. They are also looking for feedback if you, or someone close to you has been receiving help from the social services. 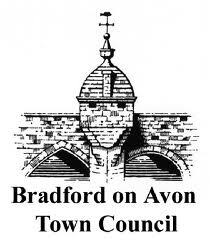 The information supplied will be used to campaign for better health and social services for everyone living in and around Bradford on Avon. The PPG are also regularly in contact with the Wiltshire LINK Scheme and one of the LINK volunteers also attends the PPG meetings. The Wiltshire LINK Scheme are local voluntary groups which offer a good neighbour service to local people who are in need either because they are elderly, disabled, single parents or perhaps are temporarily in need because of illness. This essential service provides transport to medical appointments, shopping, social visits etc. The volunteers also offer pratical help for small tasks in the home or garden and caring support. Each Link Scheme responds to the needs of the community and uses the skills offered by volunteers. To find out more information provided by this service, please click here. Ladies & Gentlemen of Melksham and surrounding areas your town needs you. Melksham and District Link urgently need drivers who are car owners to transport local people, mostly senior citizens, to hospitals and G.P. Surgeries. We also need drivers to help with shopping. This is a voluntary job and you choose the hours,times and day/or days that suit you. A fuel allowance is paid for each mile covered. Want to get involved in your local community? Interested in helping a charity? Bored and want something to do? Lonely and looking to meet new people? A volunteers action is like a stone thrown in a lake: its effects have a direct impact. At the same time, like ripples, volunteer efforts reach out far and wide to improve communities. 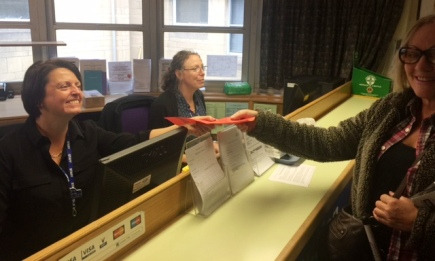 Two members of the PPG are also signed up to be part of the RUH Membership Group. Information learned via the meetings at the RUH are shared with members of the PPG via e-mail or at PPG meetings. In December 2013 the RUH received their CQC inspection and they are pleased with the positive report that highlights a number of areas of good practice. The overall report concludes that the RUH is providing patients with safe and effective care, with caring staff and good clinical outcomes. Their next quarterly meeting on Tuesday 2nd June, 7pm at The Health Centre, BOA. All patients are welcome to attend. There will be a talk at the meeting from a Podiatrist to provide information on 'the health of the feet'. During June the PPG will be launching their revised PPG patient information leaflet and joining form - with the aim to recruit more members. If you are interested learning more about the PPG please click here. Finally, the PPG will also be promoting Health Awareness in the surgery by attending a Health Check Promotion Day at The Health Centre, BOA, on Tuesday 23rd June 2015. For more information about Health Checks and to see if you are eligible, please click here. This is the first ever National Patient Participation week! During the awareness week the Patient Participation Group (PPG) at the surgery are holding their quarterly meeting on Tuesday 4th June, 7pm at The Health Centre, BOA. All patients are welcome to attend. There will be a Nurse speaker at the meeting giving interesting information about 'Health Checks'. Do you have any suggestions of what other subjects could be discussed at future PPG meetings? What medical subjects interest you?